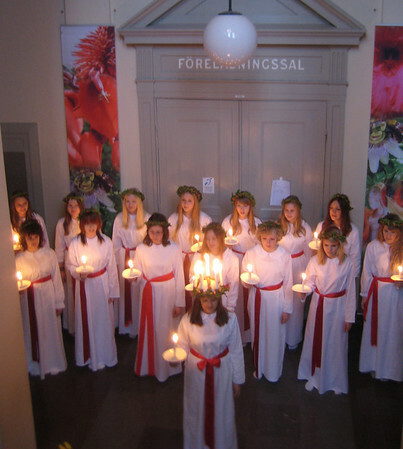 JenniferLast Sunday, 13 december, was St. Lucia day, which as you all remember from last year is an important holiday in this quite non-Catholic country. 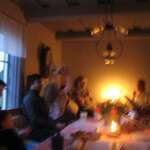 The day is marked with singing, and candles, and the consumption of glögg and lussekatter. School choirs earn a lot of money on this day, as they shuttle around from workplace to workplace giving carol concerts. Ours started at 09.30 on Friday the 11th, and this year I went early to ensure a good view in the high-ceilinged, echo-y central stairwell of the evolution museum. The concert was lovely, and was followed by a division-wide fika with the aforementioned glögg (yes, mulled wine at 10.00) and lussekatter (which do ameliorate the glögg somewhat). The weekend was quite nice, as the sun came out on Saturday, and we took a walk down the road towards the nature reserve, past the horse farms and barns, some of which now have jul decorations. They were also having some sort of horsey meeting, and giving pony rides, so the equine traffic on the path was heavier than usual. The next day, Luciadag proper, I set out to the Soldattorpet, where they were having a Luciafika (Joe had a bit of a sniffle so he stayed home). Inside was extremely atmospheric—the pictures are blurry but I think give you an idea of the atmosphere. There were several families there, and a fire in the hearth and candles on the table, more lussekatter and home-made spice bread and coffee, and carol singing, which I almost dared to join in on, a little (quietly, to myself, don't worry). One kid had an absolute screaming fit at one point, something one doesn't see too often here, but s/he was trundled out into the cold. Looking back at that picture, I think it may have been the little girl in the pink shirt hoisting the Lucia crown. If so, I bet I know why she had a fit: she was made to give back the Lucia crown, and she did not want to. Do straw goats dream of midnight swims?